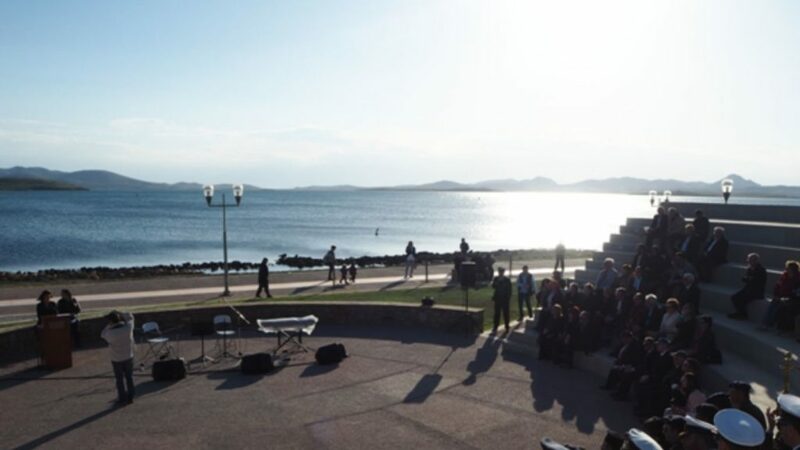 The Regional Government Authorities on Lemnos have advised Melbourne’s Lemnos Gallipoli Commemorative Committee of their plans for this year’s commemorations of the Gallipoli campaign on the island. Each year the authorities on Lemnos hold an annual commemoration of the role of Lemnos in the Gallipoli campaign. Formal services are held at the two Commonwealth War Cemeteries on the Island, where there are 148 Australians amongst the over 1,300 Allied service personnel buried. The services include the participation of Australian and other diplomatic representatives, along with representatives of the Hellenic armed forces and the Greek Orthodox Church. The Lemnos Gallipoli Commemorative Committee of Melbourne has assisted in the organisation of these services in recent years and participates in them. Last year saw the installation of the new Australian Pier memorial which was initiated by the Committee and supported by both the Victorian Government and the island’s government authorities. This year’s commemorations will take place on Saturday, 20 April 2019, with services commencing at Portianos Military Cemetery at 10.30am. The service at Portianos will include a memorial and wreath-laying service and will conclude at approximately 11am. A wreath-laying ceremony will follow at the memorial to Brigadier Stephen Saunders and a visit to the Portianou Folklore Museum. Services will re-commence at Moudros at 4pm with a flower laying ceremony at the Australian Pier memorial, north of Moudros. There may also be a short service at the Memorial at Moudros Pier. These will be followed by a memorial and wreath-laying service at East Moudros Military Cemetery, commencing at 4.30pm. This ceremony will be followed by a presentation and music at the Moudros Cultural Centre, commencing 5.30pm. The annual services will conclude with a tour and presentation by retired Major General Diogenes Tsipouridis on the Hellenic Air Force operations in WWI. Mr Lee Tarlamis OAM, President of the Lemnos Gallipoli Commemorative Committee, will lead the delegation from Melbourne, and will represent the Committee in the events. Mr Tarlamis will take the opportunity to progress discussions with the local authorities on Lemnos for the further creation of the Committee’s proposed Lemnos Anzac Commemorative Trail across the Island. Please note that the Australian Embassy will also hold its annual Anzac Day commemorative service at Phaleron War Cemetery in Athens on 25 April. These commemorative services are open to the public and all are encouraged to attend. It is always encouraging to see Australians participating in these services alongside the local Lemnian community. Anyone seeking further information regarding the Gallipoli commemorative services on Lemnos should contact jimclaven@yahoo.com.